If you are embroidering on felt you may not even need the ring as the reason one keeps embroidery taut while doing it is to prevent the embroidery stitches distorting the warp and weft threads of the fabric - felt isn't woven so in theory can't distort in that way (although you can certainly pull the stitches too tight and pucker the fabric). Also felt doesn't fray, hurrah! (Oh, but if you pull the edges about it will stretch slightly). Bias binding is a long strip of fabric cut across the diagonal of the warp and weft, with the edges turned in to the centre line of the strip; you can make your own but I always buy mine because I'm lazy and it's fiddly to make. Because it's cut on the cross it goes round corners and curves beautifully when you are edging something (or wrapping an embroidery ring). People who do patchwork frequently use it to finish off and cover the edges of their work. Yes 3 strands is fine and your DMC needles are the best - I love DMC embroidery thread too. As to which size, well that's partly personal preference, but bear in mind that if you make the occasional mistake, the finer the needle the less the resulting hole will show up. On a slight tangent, I find them much easier to thread than traditional dressmakers needles and use them for all my hand sewing projects now. I was introduced to embroidery by my mother when I was 9, loved it straight away and half a century later (ye gods, that long!) still love it. I draw my own designs and my favourite stitch is probably the French knot, but there are so many others to choose from ... I've found that chain stitch works well on felt. Probably the best advice is to always have a practice on a spare piece of your fabric first. Sometimes you have to change an idea slightly to make it work (in life too, I guess). What does warp and weft mean? I was planning to get DMC embroidery floss, I just figured I should wait until after I have a pattern to pick some out so that I can choose which colors I want. I didn't even know there *were* sizes of needles, though. Is that what the "3-9" thing is? I personally really like the satin stitch and chain stitch. Can you recommend a method for transferring the pattern I select on to the felt? I don't think my abilities are quite up to snuff to be drawing my own designs just yet. I have an idea to work with, now, though. Any piece of woven fabric will have vertical and horizontal threads - the warp is thread placed lengthways/vertical on a loom, which interlaces with the weft (or woof) threads horizontal/transverse to produce the woven fabric. As for needles, The higher the number, the smaller the needle. This is true within types of needles. Embroidery needles are commonly numbered 1 – 12, and size 12 is significantly smaller than size 1! Tapestry needles and chenille needles are numbered commonly from 18 – 28, with 28 being the smallest. Different embroidery needles do different jobs. There are several commonly used embroidery needles. Embroidery (or “crewel”) needles have sharp points and slightly elongated eyes. They’re used for crewel work and most surface embroidery where piercing through the fabric threads is necessary to the stitching. Tapestry needles have long eyes and blunt points. They’re used for counted work, drawn thread work, canvas work, or other types of needlework in which the point of the needle is not meant to pierce the fabric threads. Chenille needles have a long eye like the eye on tapestry needles, but a sharp point, and can be used effectively in crewel work and other wool embroidery, or any surface work where a longer eye and a sharp point is desired. Straw or milliner needles have an eye and shaft that are equal in thickness, which makes them ideal for French knots and bullion knots, or any stitch where the needle must pass through multiple wraps of thread. Wow! Im learning a lot more thab I expected from this! Thank you very much for the explanation. I ordered the last of the materials I need today. They should arrive by the 8th! Do please remember to to post those all-important WIP pictures - inquiring minds wish to follow the progress of the project! Naturally. Just wanted to have everything together first. 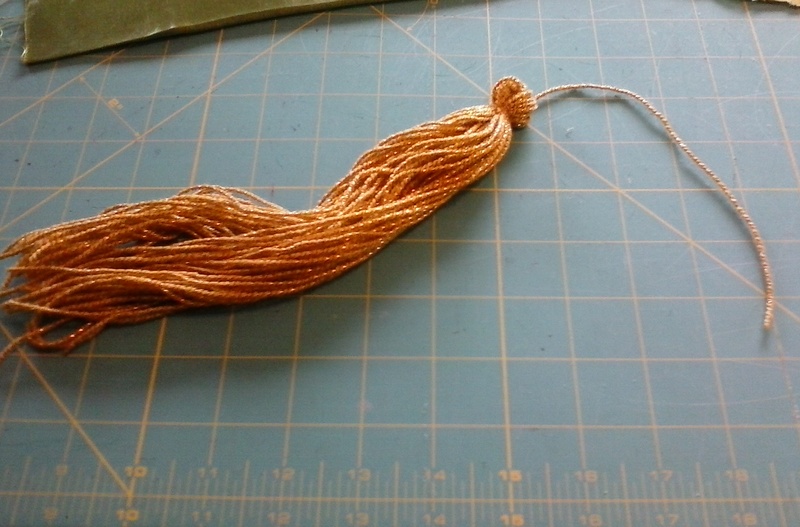 I will be making my own tassel, too. Tassels are fun to make. I've never done it before, so I'm excited. Good morning, ladies and and gentlemen. You'll have a great time, Mme. Ratchett, with one of mankind's most ancient adornments! So, yesterday, I had my head measured by a local friend, and she helped with getting the pieces cut and put together. Above are all of the cut pieces. 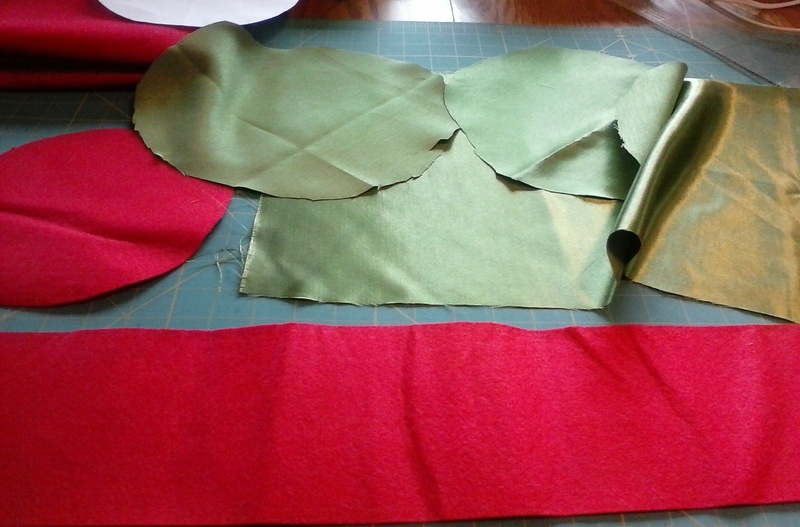 The two pieces of red felt will be covered over with the green brocade (there is a rectangular piece and two circle pieces). The green brocade is very satin-y on one side and is really nice. 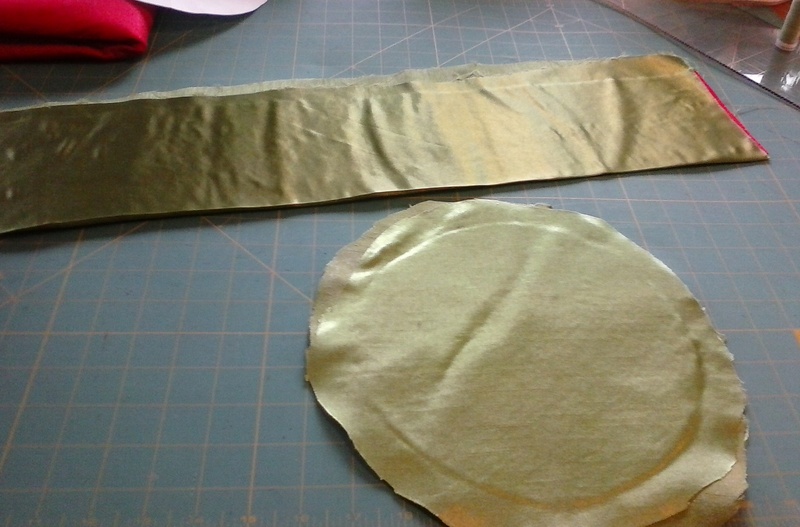 And here are the pieces of red felt after being covered over with the green brocade. I am waiting to finish assembly until after the embroidery is done. The hat is 5" tall, for anybody who is wondering. And one tassel! It was stupidly simple to make. I want to make more and put them everywhere. It was so much fun. would that be deceptively simple? Picked up a stash of embroidery thread etc., from Vinnies op shop in 'big' town today - trying to replace what was in my lost embroidery box. How clever! I've made my smoking caps from taffeta lined velvet. I like the idea of using felt! I love to see WIPs, especially when they promise to be really lovely items! Alright, the embroidery patterns have been adjusted in size on my computer, and am going to be printing them out tonight, and will start embroidery tomorrow! Prof. Cecily, I would love to see one of your hats! That sounds quite lovely! I have also become addicted to making tassels, and I may or may not have a shoebox filled with the things now... I might have a problem. Only if you run out of shoeboxes! Hmm, make enough to go around a dress several times and you could put together a 'flapper' outfit . Mine have been all gifts and from deference to the owners' wishes, no photos were taken. In any case, my smoking caps were of plain velvet, no embroidery and with plain tassels. Not to be compared with your undertaking! Well should you ever happen to take a picture of one of yours, l would be honored to see it. As an update, Im still looking for some place to print out my patterns! The reticule and the edging of the petticoat were crocheted by me, in the bus going to work and on the way back home. Ooooo, I like it, I like it! I'd confused this thread with that on the subject of crochet. Both smoking caps I've made are actually used by their owners, who live in a large draughty house in the country. What I mean to say is that a smoking cap is a thing of beauty and immensely practical, too.